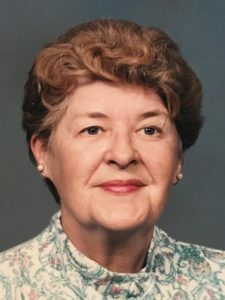 Alice L. Nacik, (nee Homme) 83, of Linden, New Jersey passed away on Wednesday, January 16, 2018. Born in Staten Island, she eventually moved to Elizabeth, NJ after her marriage to Michael. She worked for Mersk shipping company in Manhattan until her retirement in 1980. Alice had lived life to the fullest. She enjoyed weekend trips with her husband, Michael to Wildwood, as well as traveling to the Jersey Shore, Long Beach Island and trips to Atlantic City but her favorite trips were taken with Matthew and Sue where they went to see shows together as well as a trip to Disney World. Alice was lifelong parishioner of Our Savior Lutheran Church on Staten Island and she was a member of the Nansen Lodge for over 50 years. She is predeceased by her husband, Michael, her brothers, Olav, Roy and Walter. Alice is survived by Sue, Scott and Jeff as well as several other nieces and nephews. She was especially devoted to her great Nephew, Matthew Homme & (Daisy) too. She will be greatly missed by all. Funeral at Cherubini McInerney Funeral Home, 1289 Forest Avenue, Staten Island, NY on Saturday at 9:15am. Service to be held at 10am at Our Saviour Lutheran Church followed by a burial at Rosedale Cemetery, Linden, NJ. Friends to call on Friday, 2-4pm & 7-9pm. I’m sorry for your loss my mom Ruth a good friend of Alice’s just passed a week later on the 24th. We often wondered how she was doing when my mom was healthy. And I know that they had good laughs about their childhood growing up in Staten Island.